Box Text: In A World Without Borders. Terrorism Knows No Limits. Section 9 is back to give cyber-terrorists a run for their money. The Niihama terror plot was just the beginning - Berutarbe in the northern region celebrates its 20th anniversary return to the Kurile Islands, and Section 9 must investigate several mysteries in the surrounding area. Play as Section 9 members and use Motoko's agility, Batou's strength, Togusa's stealth or Saito's sniper skills to protect the festivities and take down the terrorists! * 6-player wireless battles and communication. * Train and customize your Tachikoma - add weapons and parts to enhance their abilities! * More than 50 different weapons! From hand guns and rocket launchers to sub-machine guns. 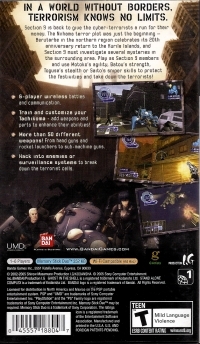 * Hack into enemies or surveillance systems to break down the terrorist cells. 11-29-2015 silverbow Box Text In A World Without Borders. Terrorism Knows No Limits. Section 9 is back to give cyber-terrorists a run for their money. The Niihama terror plot was just the beginning - Berutarbe in the northern region celebrates its 20th anniversary return to the Kurile Islands, and Section 9 must investigate several mysteries in the surrounding area. Play as Section 9 members and use Motoko's agility, Batou's strength, Togusa's stealth or Saito's sniper skills to protect the festivities and take down the terrorists! * 6-player wireless battles and communication. * Train and customize your Tachikoma - add weapons and parts to enhance their abilities! * More than 50 different weapons! From hand guns and rocket launchers to sub-machine guns. * Hack into enemies or surveillance systems to break down the terrorist cells. 09-06-2011 scott Box Text In A World Without Borders. Terrorism Knows No Limits. Section 9 is back to give cyber-terrorists a run for their money. The Niihama terror plot was just the beginning - Berutarbe in the northern region celebrates its 20th anniversary return to the Kurile Islands, and Section 9 must investigate several mysteries in the surrounding area. 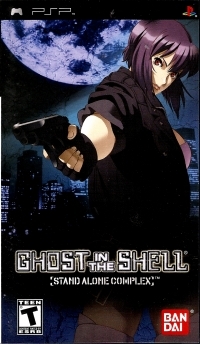 Play as Section 9 members and use Motoko's agility, Batou's strength, Togusa's stealth or Saito's sniper skills to protect the festivities and take down the terrorists! 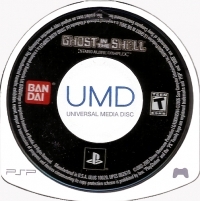 This is a list of VGCollect users who have Ghost in the Shell: Stand Alone Complex in their Collection. This is a list of VGCollect users who have Ghost in the Shell: Stand Alone Complex in their Sell List. This is a list of VGCollect users who have Ghost in the Shell: Stand Alone Complex in their Wish List.